Photo by Raffi Asdourian on Flickr and used here with Creative Commons license. On the night of July 7, reports surfaced from a peaceful Black Lives Matter protest in Dallas that shots had been fired. On the streets of the city, it was a chaotic scene as a lone gunman targeted police for murder and protestors attempted to escape the violence. Outside of Dallas, people tried to understand what was going on. Some turned to television news to get updates, but millions more turned to digital sources, including Twitter. Twitter was an invaluable tool for the Dallas Morning News that night. It was a way for the 130-year-old newspaper to leverage its considerable editorial resources to report on a live, breaking news story. While TV news typically owns breaking news events, live-tweeting enabled the Dallas Morning News to cover the story in ways that the TV news crews could not. Twitter also provided a critical alternative when the Dallas Morning News website was brought down by a tidal wave of visitors. My first live-tweeting experience took place at a technology conference. At previous conferences I had used blogs to report on the speakers and exhibits, but for this conference I used my personal Twitter account (@ilamont) to shoot out interesting facts, quotes, and observations. It was liberating. Instead of trying to compose a 400-word blog post on a single topic, which might take an hour or two to write and edit, I was able to push out dozens of tweets for each speaker as it was happening. I added the official conference hashtag to each tweet, which made it easier for other participants and fans to find and share. The conference MC even sought me out during one of the breaks to chat. However, there are risks to live-tweeting. The immediacy and brevity of Twitter means that quotes, observations, and video are posted with limited context and fact-checking. It’s easy to use Twitter to inform audiences, but false, inaccurate, or exaggerated information can make it into the feed and be spread to a global audience. For instance, during the Dallas shootings, the DMN Twitter feed shared the photo of a suspected shooter who turned out to be an innocent man. Complex or nuanced stories may not be so suited to live-tweeting. It would be difficult to live-tweet events such as the release of an economics report, the results of a ground-breaking medical study, or the official announcement of a 30-page federal indictment. Such topics are not only difficult to parse, they are also not particularly photogenic. In such a scenario, it may be tempting to stick to the highlights, but where live-tweeting excels is in the sharing of information, reactions, imagery, and details that cannot be found anywhere else. Should live-tweeting include retweets from non-official sources? People on the street may witness something that is important to understanding a story. But it may lack context or details, or it may come from an account whose ownership is difficult to verify. If images or video is involved, there may also be questions of copyright. It’s up to journalists and news organizations to make policies or on-the-spot decisions about how to handle tricky situations. Having a good network connection is critical. If no Wi-Fi signal is available, or it is overloaded, I sometimes use my phone’s personal hotspot feature to provide a Wi-Fi connection for my laptop. I generally use the Twitter Web client on my laptop and the Twitter app on my phone. However, client applications such as Hootsuite and Tweetdeck are good for monitoring certain topics either as a saved keyword search or hashtag. One of the most important pieces of software for live-tweeting is a basic text editor such as Notepad for Windows, TextEdit for Macs. If I have advance notice of the event, I will create a simple list of relevant hashtags and Twitter accounts which can be copied and pasted into new tweets. If you intend to use video, either shoot in short clips or have assign someone to edit or extract short clips that are optimized for Twitter. Twitter has a size limit for videos, as well as a length limit (currently 2 minutes and 20 seconds). Uploading a long video will take a long time and will require a good network connection. Not everyone in your audience will have the Periscope app installed. Maintaining a live video feed makes it difficult to tweet text/photo updates at the same time. Periscope requires a strong network connection, whereas text tweets can work over a lower-bandwidth connection. Periscope and video editing apps use a lot of battery power. Twitter and other services offer widgets that can be added to website home pages. If you know that you are going to be live-tweeting an event, or breaking news turns into a live-tweeting opportunity, be sure to notify your existing audiences via the website, newsletter, and other social media. You can refer them to the Twitter feed, or to a web page with the widget installed. 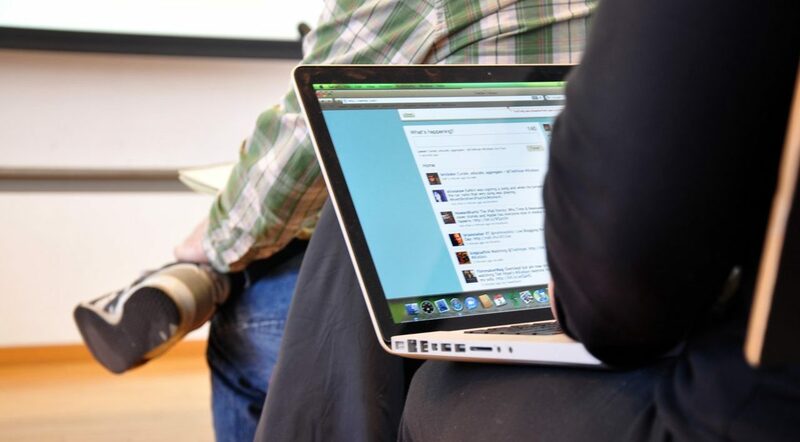 If done correctly, live-tweeting an event can deliver huge value for audiences while helping media organizations cover breaking news, community issues, and other important events. It’s not hard to get started, and if done well, live-tweeting can help your organization stand out compared to the competition.